The town of El Cerrito has a low-key, homey feel. Its residential neighborhoods contain real estate ranging from quaint bungalows in the flats to more stately homes in the hills. Home styles include period revival, Mediterranean, midcentury ranch, and plenty of contemporary properties. Uninterrupted views of San Francisco and the Golden Gate Bridge are common in homes in the El Cerrito Hills. El Cerrito's commercial districts include the El Cerrito Plaza, offering major retail chain stores and a bi-weekly Farmers’ Market. 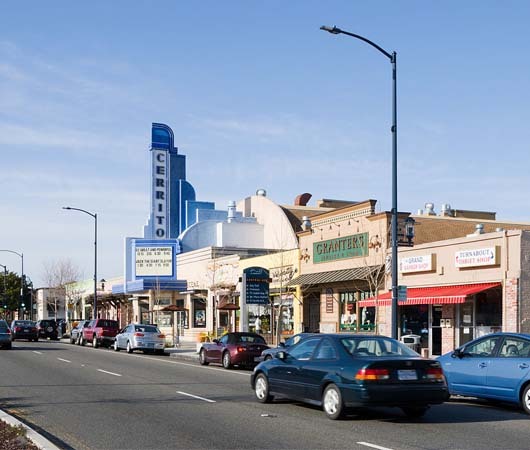 San Pablo Avenue is the main artery dissecting El Cerrito, and it features small owner-operated shops, professional services, and a wide array of great restaurants and coffee shops.